Yellow Mountain Flower is harvested from the rare yellow-flowered variety of mountain flower. Other varieties of mountain flower yield blue mountain flowers, purple mountain flowers, and red mountain flowers, but the four flowers have different alchemical properties. 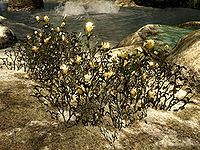 (HF) Unlike the other three types of mountain flowers, the yellow mountain flower cannot be planted at player-built homes. This page was last modified on 15 January 2019, at 18:38.